With a 17-21 ball club halfway through his first season at the helm, Great Falls manager Ryan Newman took charge in the clubhouse and challenged his new players with an old message. "It's not how you start. It's how you finish." 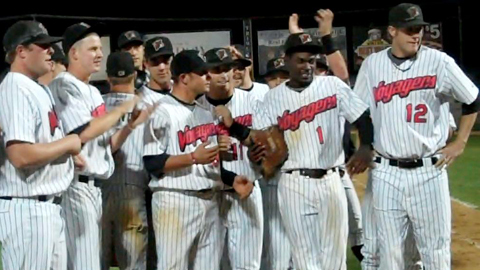 The Voyagers' long, strange trip ended Thursday night after topping the visiting Ogden Raptors, 7-1, to sweep the best-of-3 Pioneer League Finals. Great Falls finished the regular season winning nine of their final 11 games, then won five of six postseason games. The White Sox's short-season affiliate was in last place at 2011's midpoint. "We got rolling at the right time," Newman said. "We talked at orientation today about going ahead early and making a statement, trying to take care of business today. These guys responded; they have done it all year long." The Voyagers, the North Division second-half champions, secured their first crown since 2008 -- they fell in the first round the past two seasons -- and the second in their nine-year history. Ogden has lost in the Finals in back-to-back seasons. "It's really surreal," said starter Blair Walters. "It's kind of shock that it happened, last to first." Walters, who completed 5 2/3 two-hit, scoreless frames in his club's postseason-opening win last Friday, allowed a run on four hits over six innings. The 21-year-old lefty fanned seven. "He wasn't the Pioneer League Pitcher of the Year for no reason," Newman said. "To come home and have a one-game lead with him on the mound, that gave us a lot of confidence." Walters went 2-0 with a 0.77 ERA in the postseason after compiling a 9-0 record and 4.03 ERA during the regular season. The White Sox's 11th-round draftee in June has yet to suffer a defeat as a pro. "This was awesome," said Walters, who estimated he threw 90 pitches, 15 over his typical limit. "It has been a great first four months. It's kind of like of a fairytale for baseball the way it has worked out." Raptors starter Derek Cone was charged with five runs -- three earned -- on seven singles. Cone, who left with two outs in the fifth, struck out four. Eight different Voyagers batters collected one hit while the ninth, Kevan Smith, went 3-for-4 to lift his postseason batting average to .478. He amassed seven hits in nine Championship Series at-bats and also keyed Tuesday's Game 1 win. "Kevan carried us," Newman said. Andrew Pentis is a contributor to MLB.com. This story was not subject to the approval of the National Association of Professional Baseball Leagues or its clubs.